Recently, I clicked on a link to this article in Science Magazine about open data. As I read through it, I was surprised to find my name staring back at me. I was even more surprised to find that not only was my affiliation wrong, but a quote from one of my blog posts had been cherry-picked and stuck smack-dab in the middle of a section arguing that not everyone supports open data. All my blog posts are openly licensed. No one has to ask me every time they link to one of them or quotes something I have written. People often do this and I take no issue with it. In fact, I appreciate people sharing my posts. But here’s where this situation differs. First, after conversations with several other sources quoted in the piece, it became clear that the author had contacted them and given them the opportunity to correct any errors or clarify their views. I would have appreciated being afforded the same opportunity. The detail has not escaped me that every other source besides myself quoted in the piece is male. If as a journalist, contacting all your male sources and not your female ones doesn’t look like discrimination to you, then you might want to reexamine your definition. In short? “I couldn’t find any women to ask.” Hmm. The author quoted my post, so he obviously knew I existed and where to find me. Yet he never contacted me. I also don’t buy the argument that it’s so hard to find women to interview (see my previous post related to this). The first item retrieved in a Google search of ‘open data, women’ (search conducted July 4, 2014) retrieves this post about the Women in Data group. 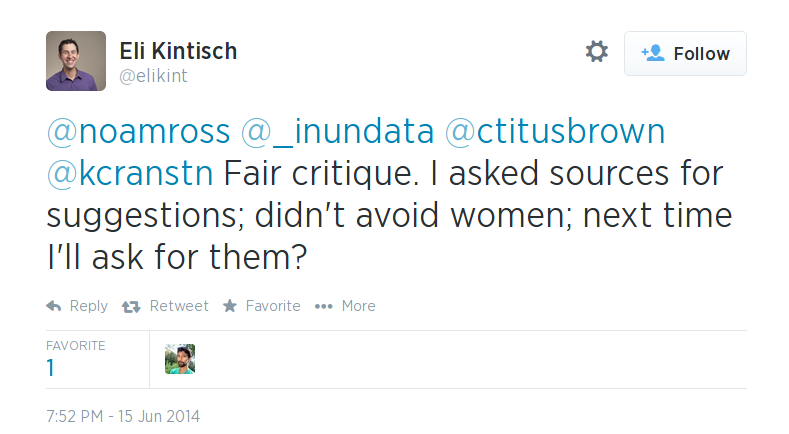 That post lists three women who Kintisch could have interviewed or asked for referrals. Just a few days after the Science article was published, Kristin Briney inquired on Twitter about women advocating for open data and received four names in a matter of hours. See? It’s not that hard, but you do have to make the effort. 1. Do not assume you can tack on an institutional affiliation when quoting articles people have posted on their blogs. In correcting my affiliation, I explained to Kintisch that there is none listed on my blog by design. I prefer my writing here to be independent of any institution for which I work. True, anyone can Google me and find out where I work. I have also written for media outlets using my institutional affiliations. However, in those cases, I have made the conscious decision to list that affiliation and have often accompanied it with a disclaimer that the views are my own. It is very different for me to decide to add that information to something I write than if someone else decides to add it for me. Please understand that you can even get people in trouble if they work for a government or federal institution and you add that affiliation without permission. If in doubt, ask your source. 2. Corrections to a published article should be explicitly noted with the date, time, and reason for which they were made. I revisited the Science article a few days after talking with Kintisch to check that the correction to my affiliation had been made. It had, but there was no indication on the article of when or why – the old text simply disappeared, replaced by the new information. Although this is perhaps a minor point, I think most people agree that it is not good journalistic practice. This one largely speaks for itself. Want a richer, well-rounded, representative piece? Reach out to women, people from different countries, diverse ethnic backgrounds, etc. There is no excuse for not finding diverse sources. Look hard. Then, look harder. 4. Contact sources on both sides of the argument. This is a no-brainer. If reporting on a controversial issue, talk to people on both sides of the argument and discuss different perspectives. Otherwise, what you’re writing is not news, it’s an opinion piece and it should be labeled as such. 5. If you quote sources that were not contacted, make that explicit. In the interest of transparency, most news pieces indicate that a source was contacted for comment but did not respond or declined. A similar statement should be added for sources that were never contacted, to indicate that the writing is an independent action by the author and not necessarily endorsed by the person quoted. And one last recommendation. If you as a journalist have been contacted by sources who felt their views were misrepresented, listen and make amends the best you can. You won’t be able to please everyone, but I think you owe it to people you quote to at least try. Kintisch and his editors were only prepared to correct factual errors (my affiliation). So, the piece stands as is with no indication that at least two people quoted therein feel their views were not properly represented. I see no reason why they couldn’t add a note at the end, simply to indicate that concerns were expressed. To Science Magazine, I have this to say. Where was the oversight? It seems to me there were several failings here that editors could have caught and corrected prior to publication. But I understand that everyone makes mistakes. I only hope that this situation inspires a review of some of the journalistic practices at their magazine.